Description: A low vine, with leaves opposite on the stem and shiny deep green. 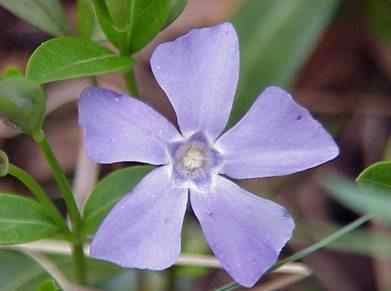 Flowers are light blue to violet blue. It usually forms a fairly dense ground cover. Often you will find great patchs in abandond home sites or forgotten grave yards.Another species V major has a slightly larger flower and leaves with a hairy margin. Both escaped from cultivation. One of the many flowers that came into this country through immagration.